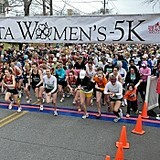 Congratulations to all the participants of the Atlanta Women's 5K! Ladies, you should be proud! A big thank you goes out to our volunteers who came out to help with this year's event. Photos from the event are available on marathonfoto.com. Team results from the 2011 Atlanta Women's 5K can be viewed here. Each entrant will receive an Atlanta Women's 5K performance shirt on race day. In addition, each finisher will receive a flower. Gift cards will be given to the overall individual Open and Masters champion; top 3 Open teams; top Mother/Daughter team; top 2 Masters teams; top Grand Masters team; and top Sister/Sister team. Gift cards will also be given to the top 3 finishers in the following age groups- 14 & under, 15-19, 20-24, 25-29, 30-34, 35-39, 40-44, 45-49, 50-54, 55-59, 60-64, 65-69, 70-74, and 75+.